Now that I’ve gushed about fashion, croissants, and macarons, I need to share a Paris disappointment: oysters. It’s not that the Huitrerie Regis wasn’t a lovely restaurant- it was. And it’s not that their food was badly kept or prepared- it was fresh and beautiful. A tiny, friendly, sparkly (both lights and bubbles) oyster bar in Saint Germain des Pres, HR’s menu was just wine, oysters, prawns, and clams, so they knew what they were doing. The problem was, as it turns out, I don’t like French oysters. Like, at all. FINES: an official designation that means small to medium-sized. SPECIALES: larger and more fleshy than fines. FINES DE CLAIRE: large oysters that mature for two months in salty claires, or marshes. SPECIALES DE CLAIRE: even larger than fines de claire, these mature for at least two months or more. All of these oysters came in deep, thick shells. 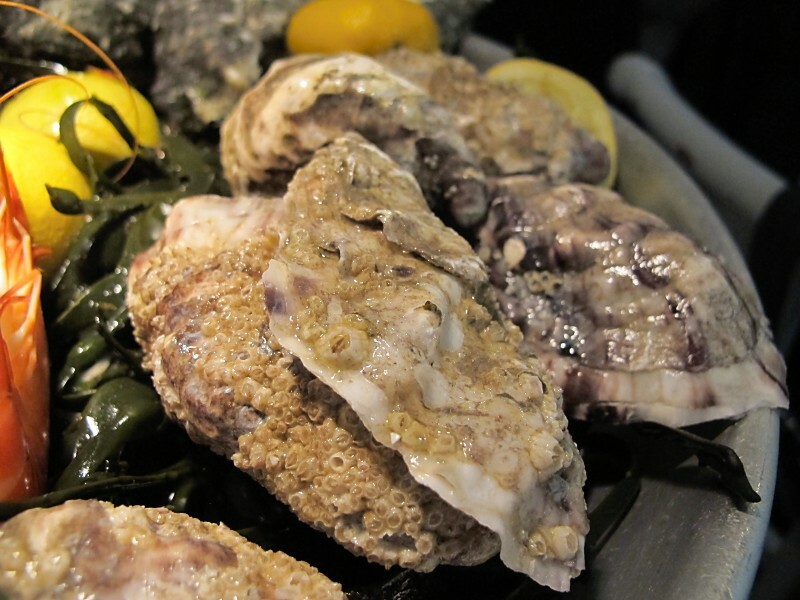 The meat was greener, and tougher than New England oysters. And even though I ate 12 of them, desperately straining to find subtle nuances with each bite, all I tasted was salt. Bitter, excessive, off-putting salt. How could these be the inspiring oysters Hemingway wrote about? We consoled ourselves with a large white dog that came in with his owners and then padded over to the kitchen to be plied with prawns. 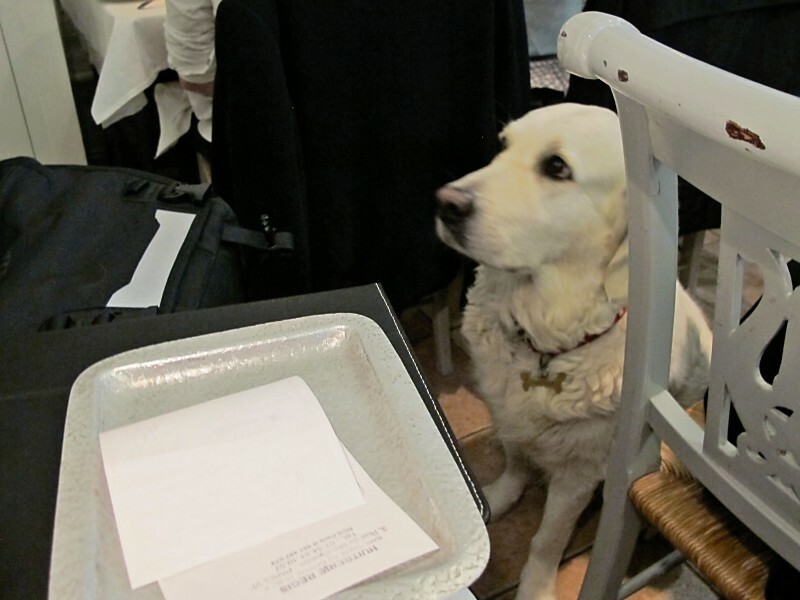 Before settling down under his master’s chair he visited every table, just to say hi. Only in Paris. The salty oysters were a crushing blow, and both Dave and I tried not to admit how disappointed we were. But now that we’re back, it is comforting to know that even if I can’t get a decent almond croissant, I can eat Island Creeks any time I want. Kate: I share your preference for smaller oysters with more flavor. In France I like the Belon oysters. However, some of the very best oysters that I have ever had were @ the Neptune in the North End!